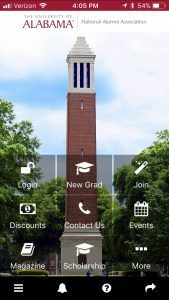 Unlock your nationwide benefits today by downloading your UA Alumni App! Become a part of the Alabama family and join the Association that helps support The University of Alabama. Over 34,000 members include not only alumni, but also thousands of University of Alabama supporters and Crimson Tide Fans. Our members know that the best way to receive news from campus is to have an active membership in the Alabama Alumni Association. By joining the Alabama Alumni Association, you can share in the University experience. Membership for Joint Donors (Husband & Wife) is a minimum of $65 and $40 for an Individual Donor. Make your check payable to the Alumni Fund and mail it to Alabama Alumni Association, P. O. Box 861928, Tuscaloosa, Alabama 35486-0017 or you can join online. 15% discount at Hotel Capstone. NO BLACKOUT DATES. Use code UAALUMNI in the Corporate Box. Alumni Membership Card must be shown at check in. Apply for your Alabama Alumni Affinity Credit Card today! See what the BAMA Credit Card can do for you!